It’s no news that cryptocurrencies have gained acceptance and dominance in the 21st century. The aspect of exchanging cryptocurrencies to fiat money by bank transfer or credit card through various online platforms was a dream come true. However, a lot of lay people find it difficult to gain access to the crypto community. Furthermore, the time consuming registrations into the crypto community coupled with the unpredictability of platform operators and the required disclosure of personal data is disheartening. Not to talk of the high hidden charges associated with the whole process between the banks and states. But with just a mobile phone and an internet connection, you can kiss those challenges goodbye. Wondering how this is possible? A team of innovative professionals developed a unique platform in 2017 called KONIOS. With this extra ordinary platform, you can be sure of a secure exchange platform for cash & crypto currencies and helps you maximize service on the virtual exchange platform. It is based on blockchain technology and registered with high security protocol which provides transparency as well as face to face transactions in the Konios platform. All activities on the platform sre operated by a decentralized system while establishing the entire high tech instrument to furnish the data system and the server system for the better performance of the operations. The Konios token has the symbol KON. It is a utility based on Ethereum. Payment methods are through wallet to wallet and bank wire. The accepted currencies on the platform are Ethereum, Bitcoin, Fiat( USD, EUR,CHF, RMB,KRW). The ICO starts may 1st and will last for 60days or until the hard cap is reached. The total supply of tokens is 5, 000,000,000 KON. 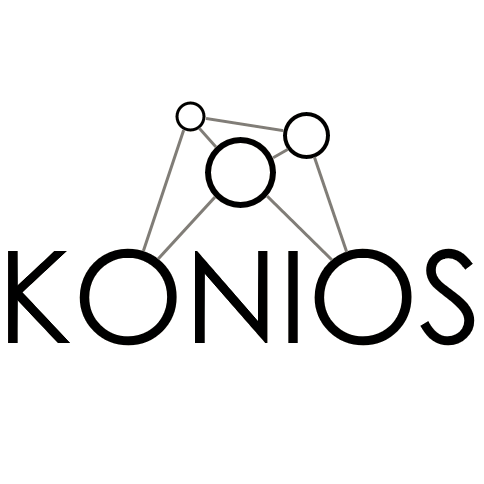 • January: Develop and formulate the idea of the KONIOS platform. • March: Develop the solutions of the exchange principle of Face-to-Face (F2F) operations platform. • July: In the Projects, join new team members. • September: Develop and launch the Whitepaper for all. • October: Develop the main website in the web world. • November: This Platform gets strong support from the Advisors. • December: Development starts over the platform until November 2018. • January: For the last team member Completion of whitepaper and inclusion are developing. • March: Develop the Android app and develop the Ads bounty program. • May: Launching the Initial Coin Offering (ICO) operations on the market: Release the KONIOS app over this platform. 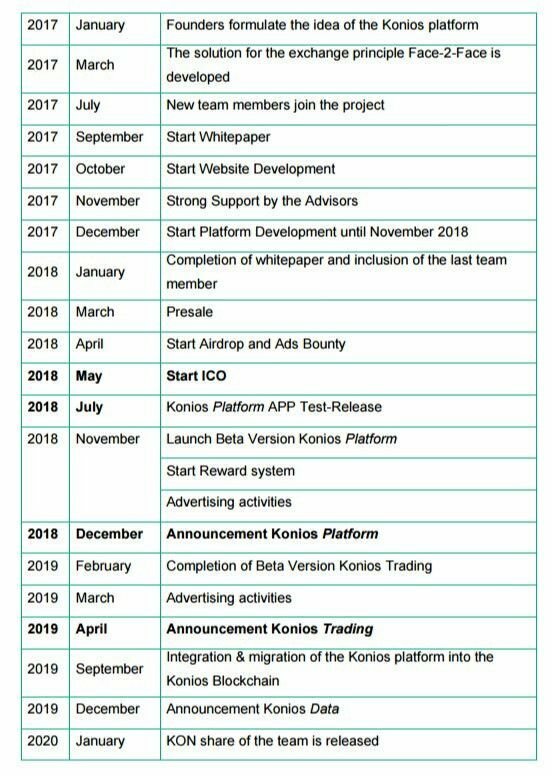 • November: KONIOS platform launch the beta version for the people, also start the reward program for the people as well as the advertising activities. • February: KONIOS develop the beta versions of the treading operations. • September: KONIOS Blockchain technology integrated and migrated the KONIOS platform operations. • January 2020: Release the KNO token for the team.